I used to lock myself in the bathroom stall and cry when the girls picked on me. My cousin Hanna says they teased me because I was the only new girl in the seventh grade. But some of them just liked being mean. Hanna says there are people all over the world who enjoy making other people suffer. Like Hitler and Goering and Goebbels. I wrote a story and made the meanest girl – that Nancy Weiss – a bad character. When the teacher read my story aloud in class, Nancy knew I was talking about her. So did everyone else. She turned bright red, and started shifting around in her seat. She thinks she’s special because she has blond curls you just want to dip in the inkwell. She’s lucky I don’t sit behind her. When she heard my story, she asked to be excused. She went to the bathroom and didn’t come back for a long time. “Good for you,” Hanna said when I told her. Hanna is twenty-one. My dad brought her here from Latvia right before the war. After that you couldn’t get out. “Sure,” I say. They must be important writers. Witness to history, sounds good, doesn’t it? That’s what I’m going to be. Now that I’m eleven I can go to Hanna’s apartment by myself. It’s easy to get anywhere on the bus. I like to buy a hot dog from the Sabrett man on the corner who always calls out “Hotta Dogga.” He doesn’t just have an accent, like Lydia from Poland who says “stop spleshink” when any one gets close to her in the pool. The hot dog man doesn’t speak any English at all. He only knows ‘Hotta Dogga.” I can tell because I tried talking to him and he didn’t understand a word. He just smiled and pulled the pale pink hot dog out of the cloudy water, smeared it with mustard and handed it to me in a paper napkin. It’s better to know English to get along in this country. Maybe the hot dog man will let me teach him some English. I could do it like an after-school activity, like a kind of social service. I could buy a second hot dog so he’d know I also want to help his business. The bus belches to the corner. I get a seat near a window. The mustard is drippy, but I catch it with the napkin before it gets to my plaid skirt. I love Hanna’s new place. It’s just a studio but it has everything she needs: a pull-out sofa, a two-burner stove, board and brick shelves stacked with books, an Underwood typewriter and a desk with cubbyholes. I can read all afternoon there without Mom telling me to do my homework or clean out my closet. I always do my homework and my closet is full of stuff I need. Hanna and me listen to classical music, popular singers, or we talk about the news. Hanna goes on reading aloud: “’Jews must be cast off and guarded by sentries. Jews must work inside their ghettos.’ This Rosenberg wants to ‘prevent the spread of the Jewish influence to other parts of the world. The projected Nazi code will realize the ultimate aim of the anti-Jewish policy, namely the ridding Europe of the last Jew.’” Hanna throws the paper down on the table. I read the article again on the bus going back. Everyone believes The New York Times, even if Hanna says it doesn’t always tell the whole story. But here it is. The Nazis are bragging. They’re saying look at what we’re doing. We’re proud of ourselves. I put the article in my school bag. Why do they think everyone wants to “prevent the spread of Jewish influence?” My Mom and Bubbe, her mom, say Jews are a good influence, because part of the Jewish tradition is to help others and make the world a better place. But maybe everyone else doesn’t know this about us. The Nazis must think lots of people agree with them, otherwise they wouldn’t be bragging about it. The next morning I stop on the corner of Broadway and 72nd Street. My best friend Ruth Saltzman comes up the block from where she lives above her father’s jewelry store. Ruth and her family came to New York five years ago. They all have heavy accents. Mom says if you come here before you’re eleven you will lose your accent, so Ruth will. Mom also says she will only buy watches from Mr. Saltzman. She supports Jewish refugees whenever she can. “He went back, your uncle?” Ruth asks. I take the article to Mrs. Bloch, who looks worried when she reads it. Mrs. Bloch gets busy rearranging the Delaney cards in their folder. Each card has the name of a student and helps teachers keep track of who they are and where they sit. Mr. Delaney must have invented the system. That’s how you get your name on things. After the bell rings, we all race down the steps and into the schooIyard. It’s one of those warm February days when everything seems to be thawing and the picnic table near the wire fence where we hang out is drippy. I run into the girls’ room and get a bunch of paper towels and we wipe it off. Then I pull out the article. Wow, my friends say. They can’t believe it. We’re Americans and we’re not used to what Hanna calls “a public announcement of persecution.” My friends at P.S. 84 are pretty much Jewish, except Patrick, and the article upsets them like Mrs. Bloch said, but in a good way. Susan pulls out a Hershey bar from her school bag and breaks off enough pieces to hand around. She thinks we should hold a meeting after school next week, get permission to use the auditorium and find a speaker. Hanna could get us someone. Ruth puts a rubber band around her blond hair and says that will make us feel good like we’re doing something; she thinks we should write letters to President Roosevelt, too. But Barbara, who’s turned into a know-it-all this past year, says the President never reads those letters. Some secretary tosses them into a wastebasket and sends you back a form letter. Patrick says Barbara’s right. He’s taller than any of us and always gets attention. “Besides, we’re not old enough to vote,” Patrick says. “Why would the President care what we think?” Then the Good Humor truck lets us know it’s here by playing its little song and everyone forgets we’re talking about something really serious and goes for ice cream. I have a chocolate pop. I like to make it last, but you can’t tell until you’re finished whether you got a lucky stick. It’s printed “Lucky Stick” in small brown letters. That means they give you a free extra ice cream. Once it even happened to me. “We haven’t heard from my Uncle Sol in over a year,” I say. “I have an idea,” Josh says. He’s always so quiet you forget him. But he stores up stuff like a squirrel. He looks like one too – small and frisky, with buckteeth. “Well the teachers are our bosses,” Barbara says. “They act like bosses anyway.” She should know. She’s pretty bossy herself. Of course, I should have thought of a picket line. My own cousin Hanna is a big shot in her union. We girls are going to dress in black – like we’re in mourning – black T-shirts and black leotards from dance class. Also our black Capezios. Patrick says he’s going to wear his black belt and the brass buckle with the skull and crossbones. We’re writing our signs in black ink, with red ink spilling down from the letters like blood. We have to throw out a few because they get messy, but we have enough good ones. We’re going to march back and forth in front of the steps before the bell rings at 8:30. We’re pretty sure no one in our school will cross a picket line. We’ll wave our signs and chant together: “No Time To Lose/Save the Jews,” “Don’t Refuse/ Teach War On Jews,” “Stop Hitler’s War/At P.S. Eighty-Four.” I don’t tell my mother because she’ll tell my father and he will be angry. He’ll blame Hanna. I don’t tell Hanna because she has an opinion on everything and I want to do this myself. What can I say? Someone ratted us out. When we get there, the school guards are waiting for us. They let us march for maybe five minutes. Then they run at us, take our signs and make us go inside. One grabs my arm so hard it stays black and blue for a week. I yell, “Free speech. What happened to free speech?” Susan’s father works for WNBC radio and he’s there too. One of his guys interviews me and Josh after school. On the radio that night they talk about the demonstration at P.S. 84. Which of course my dad hears. And now he’s sure his socialist niece Hanna got us to picket. He won’t listen when I tell him it was my idea. He sends me to my room and tells me I can only come out to go to school. It’s the worst day of my life. I can hear Dad yelling at Hanna over the phone, “You’re a bad influence on Alice.” My own dad is acting like Hitler. He wants to “prevent the spread of Jewish influence.” Hanna’s influence and mine. That’s when I decide to write what became my famous letter to the editor of The New York Times. Author’s Comment: I actually had an uncle who visited New York and went back only two weeks before Hitler invaded Poland, as well as a cousin very much like Hanna. I only wish I had been a courageous activist child like Alice. I wasn’t, but at least fiction lets you rewrite personal history. 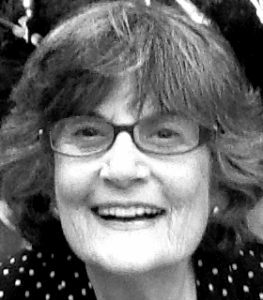 Marilyn Ogus Katz taught at the State University of New York at Purchase, was dean of studies at Sarah Lawrence, wrote many academic articles, and came late and happily to fiction in her sixties. This story is in a collection of linked stories about coming of age in an immigrant family in 1940s New York. Others have appeared in Writer's Digest Best Short Shorts, 2015, Tupelo Quarterly, Hadassah Magazine and Jewish Currents. Her novel, The Old City, follows Uncle Sol back to Latvia where he and his family are caught tragically between Hitler and Stalin. It has just been submitted to publishers. View More: Next piece "On Strike", Home, Archive. I love the way Marilyn Katz captures children. She manages to catch that innocence and confidence only a child can convey in a time of horror. Wonderful Marilyn. You are courageous in so many ways! Great story!